On the 15th October 1764, Edward Gibbon observed a group of friars singing in the ruins of the Temple of Jupiter in Rome, which inspired him to commence work on ‘The History of the Decline and Fall of the Roman Empire’. Overall it is hailed as a masterpiece because of it relative objectivity and heavy use of primary sources. Though, there is also much in it that offends and draws criticism from scholars and modern historians. In particular, his scathing views of Christianity and his neglect to fully focus on the later history of the empire (Byzantium). Nevertheless, he is often referred as the first ‘modern historian of ancient Rome’. Though lets not turn this article in an analysis of his work, but more of a ‘celebration’ that he had the foresight or vision to write it. Perhaps also we could momentarily talk about the man himself. 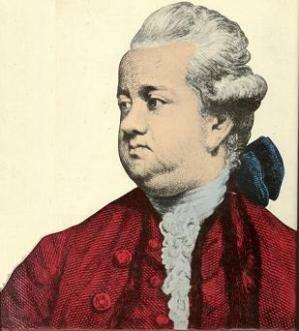 Born on May 8th 1737, he struggled in his early years with bad health. He famously described himself as “a puny child, neglected by my mother, starved by my nurse.” With his health improving by his teens, Gibbon was sent to Oxford by his father. He was widely read having been tutored privately on occasion and having studied in the family library, but nothing would prepare him for what he thought of Oxford, that being one of the most unprofitable times of his life. Oxford scholars were, as Gibbon once described, as being steeped in “port and prejudice.” He would eventually be expelled from Oxford for religious subversion. Born and raised a Protestant he would change his faith to Catholicism earning him the wrath of the school and his father. His father would send him away to Switzerland, where after two years of study he would master French, Latin and Greek. More importantly, he would also renounce his Catholic faith and receive again the Protestant sacrament of communion. One might wonder what his faith told him about himself and the times that he lived in ? It would have had some bearing on his views considering the history of religion is for Gibbon very closely associated to the decline and fall of the Roman empire. A few years later he would publish his first book (a short work in French) at the urging of his father. It was his first taste of celebrity and he quite liked it. Though he also felt somewhat dissatisfied for he had not yet accomplished the historical work that he so long desired. The work which Edward Gibbon would finally deliver would come twelve years later in 1776 as volume I and conclude with volume VI in 1788. Gibbon’s rewards us as readers with not only a good story, in which we encounter ‘barbarians’, bravery, corruption and endless warfare to name a few, but with themes that resonate today. The header image is of the Ruins of the Forum, looking towards the Capitol, 1742, by Carnaletto. Wow, I was almost going to write an article on this myself! I need to read it again. When I first read it, I was also reading Tacitus’s ‘Annals of Imperial Rome’ and Robert Graves’s ‘I, Claudius’ around the same time – and my memory of all three has all gotten mixed up. Even some 200 years later its still relevant and controversial. I read (relevant sections of) Gibbon, Norwich and Treadgold always before getting ready to write my next Byzantine history article. Helps me to focus! In the mid 1990’s I was trying to read a little bit more about my parents birthplace, Croatia. As it was there weren’t any specific history books dedicated to it, so I found myself reading other European history that mentioned Croatia to get my fix. I accidentally stumbled across my first Byzantine history book, entitled ‘The Byzantine Commonwealth: Eastern Europe 500-1453′ by Dimitri Obolensky, which had interesting sections dotted throughout on the Balkans and Croatia. Being curious I thought it would be a great investment, so I bought it. I initially struggled through it, but by the end of it I was completely mesmerized by this so called Byzantine Empire. In an around about way I hope that if I talk and write about it, it will gain the recognition that it thoroughly deserves, after being ignored for so long. In the last fifty years or so, many great historians and teachers are helping to correct the wrongs of the past. I truly believe if it wasn’t for the history of the east (which includes Islam’s influence) there would be no west.